George Manby (1766-1854), a boyhood friend of Lord Nelson, concentrated on adapting a 6 1b mortar extensively used throughout the Napoleonic wars as the main armament of Bomb Ketches - to carry the line twixt ship and shore. His initial idea was that a boat should then be hauled out to the wreck on the rocket line, and to this end the apparatus was adapted to enable the use of any available boat. 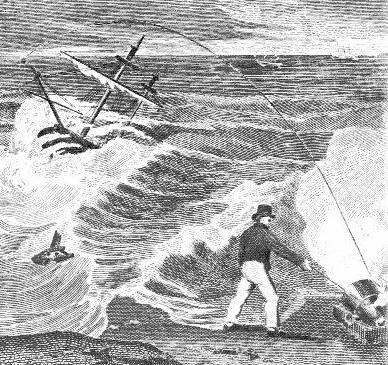 The first recorded rescue, using the new Manby apparatus, was effected by this line and boat method on 18 February 1808. The Plymouth Brig Elizabeth stranded 150 yards from the shore at Great Yarmouth and with Manby himself in charge, the crew of seven were brought to safety under conditions which would otherwise have spelt their certain death. Manby's equipment was not without its critics, the prime objection being the reliance on having a boat to hand to effect a rescue. Manby immediately set to work on an alternative using a basket or cot. This more complicated method was not initially to Manby's taste yet in it lay the germ of the apparatus which was to do such yeoman service until its demise in 1987. The idea was that, as soon as the line carried over the wreck, a large hawser and a tailed block would be hauled out with an endless whip line rove through the block; the crew would having hauled the block to the ship, make it fast at as high a point as possible. Meanwhile the shore party would make an anchorage with three stakes driven into the ground and a gun tackle purchase made fast to them. As soon as all was fast the shore end of the hawser would be passed through rollers at each end of a canvas and cordage cot; the loose ends of the endless whip then made fast either end of the cot which could then be hauled twixt ship and shore with suitable tension being kept on the hawser by means of the gun tackle purchase. Thus the forerunner of the modern whip and hawser equipment was born. It was felt that if no cot or boat were available then a clove hitch in the bight of the line would be passed over the head of the casualty and he would be hauled ashore (how many crushed chests would have ensued from this crude method is not recorded). Then at a wreck in January 1814 a form of sling was improvised by cutting off a length of hawser and making a grummet on the hawser large enough for a man to sit in, the bight of the whip was made fast to the grummet and hauled between ship and shore effecting the rescue of all seven crew. Manby fought bureaucratic apathy for many years but the only real progress with his method was around the coast of East Anglia. To emphasise this point by 1823, 220 lives had been saved around the coasts of Norfolk and Suffolk and only 19 over the rest of the country. 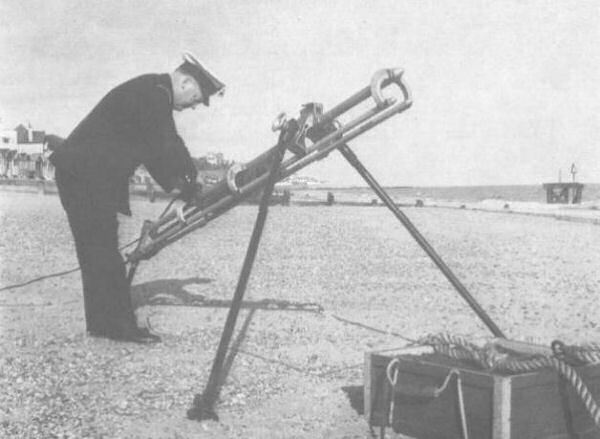 No more than 100 sets were ever introduced to the coast and it is probable that the final death knell of Manby's mortar was the advent of Captain Boxer's rocket in 1865. Manby devoted his life to maritime rescue and, when he died in 1854 had the satisfaction of knowing that 1000 lives had been saved using his inventions. I really got interested and found the video describing the modern version of this resque rocket http://www.videorolls.com/watch/italcersrl nice to learn about it anyway.